The art of a Chinese artist Fang Lijun is characterized by a few themes that connect his works like a red line. Bald-headed men, water, clouds and the sky. He is best known for a woodblock printmaking. Fang Lijun was born in 1963 in Hebei province, so his memories as a child and youth were marked by the years of the Cultural Revolution and its aftermaths that lasted until roughly the late 1970s. He had studied ceramics at the Hebei Light Industry Technology School, and later woodblock printing and painting at the renowned Academy of Fine Arts in Beijing. At the Academy he developed an interest in woodblock printmaking and painting. He graduated in 1989 at the Fine Art Academy of Beijing. His career began in the 1990s, when he exhibited outside China and could even participate in the Venice Biennale twice, in 1993 and in 1999. He came to ultimate international fame when the American Time magazine had published one of his paintings on the cover of the December issue of 1993. Fang Lijun is regarded as a major proponent of a modern Chinese art movement called Cynical Realism. The term was created by Li Xianting, a famous art critic, publisher and mentor who has supported the Chinese avant-garde artists since the 1980s among others as publisher of an art magazine. When Fang Lijun began his art studies, the academies were still teaching art in the tradition of Social Realism and old Chinese art. Woodblock printmaking was originally invented in China, and only later it was refined in Japan to what we call today Ukiyo-e. 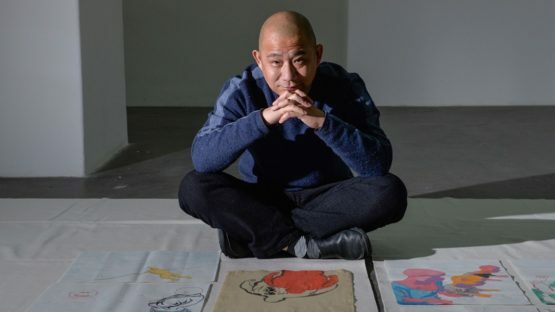 It is a special merit of Fang Lijun that he picked up Chinese woodblock printmaking and integrated this technique into his personal style and technique. The artist’s specialty are monumental wall “paintings” that are put together by many panels of woodblock prints. Fang Lijun’s art has developed since the 1990s. But his subjects have remained the same. He shows dumb-looking, stout men in water, or against a sky. Also clouds are a frequent element in Fang Lijun’s images. Some of the paintings remind of the images of Mao Zedong’s famous swims in the Yangtze river, a once carefully orchestrated political propaganda demonstration. Fang Lijun’s artworks are meticulously executed. This is a common characteristic of contemporary Chinese artists. After all, they all went through an art training that put a lot of emphasis on skill. Today Fang Lijun lives and works in Beijing and Dali in Taiwan.